This is one of the best compassion quotes out there. Download the free printable and be reminded to be more loving and compassionate towards those around you because you never know what someone is going through. As Easter season gets closer and closer, I can’t help but think about my savior, Jesus Christ, and all He’s done for me. Last year I created these Christ Aid Kits as part of an object lesson to teach my young women about Christ’s atonement and this year I created a simple printable with one of my favorite quotes from this talk that’s a great reminder of how we can exemplify Christ in our lives – through compassion toward others. When I think of compassion, my mom immediately comes to mind because she’s just literally the most compassionate person I’ve ever met. 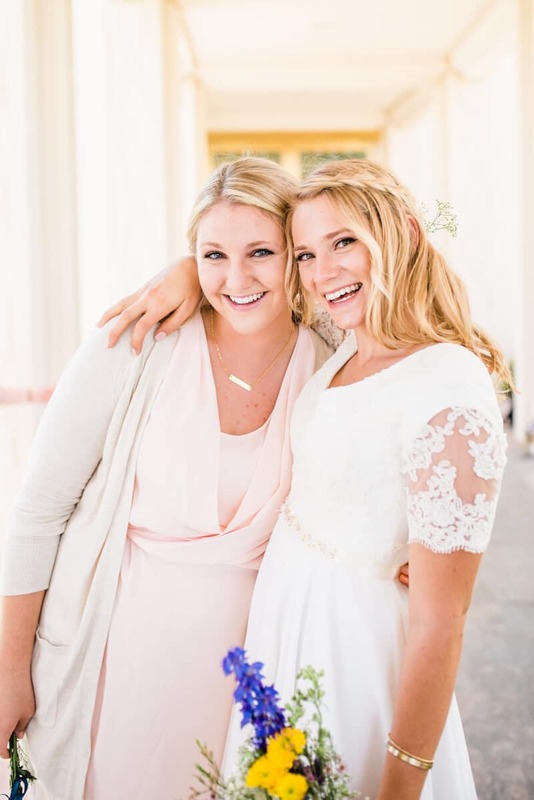 But I’ve written about my mom multiple times so instead today, I’m turning my blog over to my little sister (gasp!) to tell you about the most compassionate person she’s ever met – her best friend Wendy. And after working with Wendy on my Valentine’s Day balloon candy gram project and DIY Beauty and the Beast shirts, I can honestly say she’s right up there with my mom. So here you go, my sister. I met my best friend Wendy while serving a mission for the Church of Jesus Christ of Latter-Day-Saints in the Philippines. We instantly connected and fortunately followed each other through transfers and areas throughout most of our mission. Countless times during our mission, we found ourselves sitting, talking, taking turns listening to each other, and building off each other’s ideas until Wendy fell asleep in some ridiculous position on the floor. We have come a long way since those early mission days. We have both grown, learned, and taught each other so much. There is one thing I am constantly learning from Wendy even after all of these years – compassion. Never in my life have I met anyone who hates the feeling of contention so much that she literally can’t sit still. She has to fix the situation; it’s like an ache to her heart that she has no choice but to relieve, even when it has nothing to do with her. She is filled with so much compassion that she can’t stand knowing other people aren’t happy. Barbara Thompson said, “Compassion means to feel love and mercy towards another person. It means to have sympathy and desire to relieve the suffering of others.” I have watched time and time again as Wendy befriended someone who needed a friend. And when she felt moved to buy groceries for the person behind us in line. And when she invited a complete (harmless) stranger on a road trip because she wanted her to feel loved. Wendy exemplifies the love and compassion that our Savior has for all of us. You can see it in the way she interacts with those around her and in the kind way she treats anyone she comes in contact with. It is just who she is and always will be. Christ taught us to be “moved with compassion” towards those in need (Mark 1:41). Wendy exemplified this almost daily when we were roommates in college. I remember one time I was going through a particularly rough time and was pretty down. When I was driving us home from church one Sunday, she looked at me with eyes full of tears, and expressed how much she wished she could make it better for me. I have never in my life seen someone feel so deeply what another person was feeling. It was as if she was feeling everything I was feeling because she loved me so much. Through that experience with Wendy, I was able to better understand the love Christ has for me and the compassion Christ showed when He took the pain of the world upon Him through the atonement. He truly took the pain of the world upon Him so that he could lessen our suffering, so that He could make it better for us. Wendy can’t ever fully know the extent in which her pure example has led my heart back toward the Savior. Her example back then, along with countless other times, has given my heart more peace than any worldly pleasure or escape ever could. She radiates His love and compassion by simply loving everyone she comes in contact with, with the same pure love Christ does. While I am grateful for Wendy’s example in my life, I know that not everyone has a Wendy to help them grow closer to Christ and feel His love. And even if you do, another way to find peace and feel Christ’s love is by learning about Him, following His example, and using His atonement in your own life. The resources at Mormon.org can help you learn all about Christ and His incredible example. Because at the end of the day, His love is the source of all peace. It cannot be faked nor replaced. He is the true #PrinceofPeace and like my friend Wendy, is always understanding and waiting to ease our burdens. He will have compassion on us as we humbly turn to Him and seek His comfort. As Easter quickly approaches, I sincerely hope that we all can find our own Wendy in our lives, someone that can help us draw closer to our Savior, the #PrinceOfPeace, and the reason Easter even exists. And I hope that we can all be a little more like Wendy, and like the Savior this Easter season – stretching our arms out to all of those around us with compassion, with understanding, and with love. 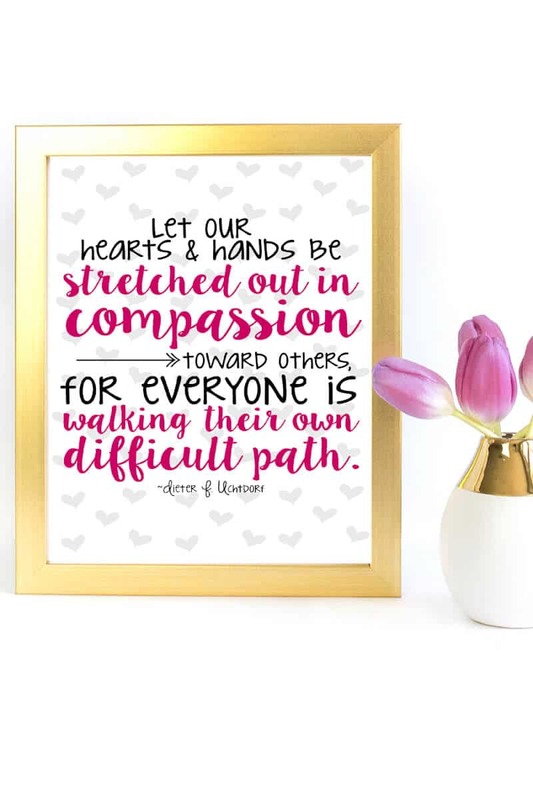 You can download the free printable of one of my favorite compassion quotes by clicking on the image below or filling out the form below to download. I recommend printing in color on white card stock. 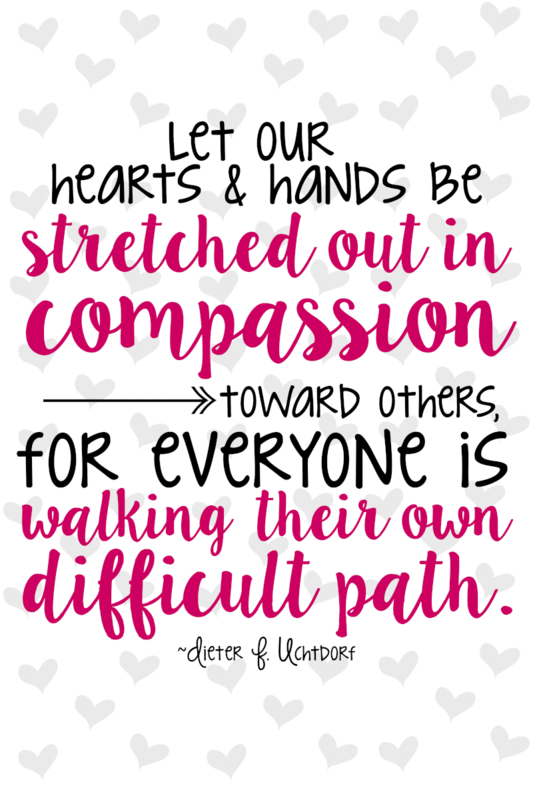 I created a full-size version to print and keep in my home, but I thought they’d also make great Relief Society compassion handouts (great for young women too), so I created a sheet with four handouts as well.